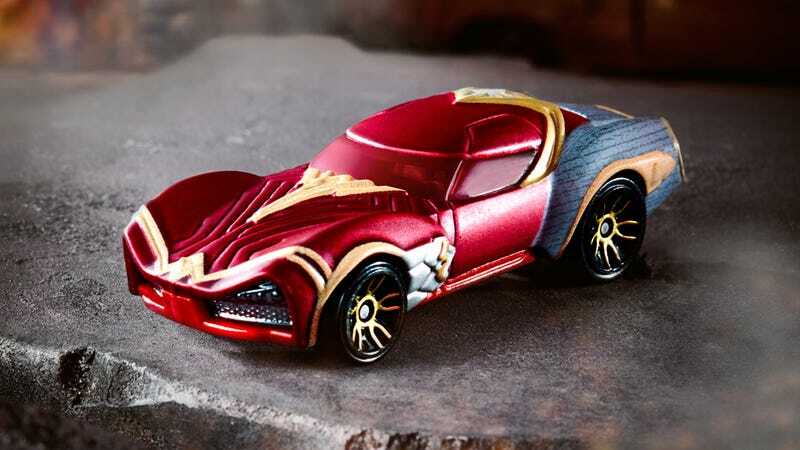 In support of Women’s History Month, today Hot Wheels revealed four new character cars based on female headliners from Marvel, DC, and Star Wars. But the star of today’s miniature auto show is definitely the Batman v Superman: Dawn of Justice Wonder Woman character car. Its gold and red paint job is carried through to a red tinted windshield that gives the Wonder Woman car a menacing glare. And the front grill, which curls up at the sides, almost has a bit of a snarl to it. Gal Gadot just might have the best Hot Wheels car from that upcoming blockbuster. In addition to Wonder Woman, today Hot Wheels has also revealed the character car for Marvel’s Wasp, who will be played by Evangeline Lilly in the upcoming Ant-Man sequel, but who has also been a staple in Marvel comic books for over 50 years. A pair of swept back wings won’t actually allow this vehicle to fly, but as far as Hot Wheels cars go, this one certainly has the most unusual design of all the new cars being revealed today. Star Wars characters like Princess Leia, Rey, and Captain Phasma were already given the Hot Wheels treatment by the time The Force Awakens arrived in theaters. But Mattel is adding to that collection with a new Maz-themed character car, featuring bulging headlights reminiscent of her distinctive glasses, and a vehicle design that looks inspired by the BMW Isetta. And finally, while there have been several iterations of the Black Widow Hot Wheels character car from the past few years, today we have another new version featuring a paint job that reflects how the character will look in the upcoming Captain America: Civil War sequel. You can expect these new Hot Wheels to pop up in toy stores over the coming months, joining other character cars like Cat Woman, The Guardians of the Galaxy’s Gamora, and the aforementioned Star Wars vehicles you can check out below. Contact the author at andrewL@gizmodo.com.